Fixturecraft’s product line was designed, perfected and still made in the USA for the last half century. Fixturecraft products are manufactured from heavy duty steel to last through many years of rough usage. Our unique reinforced designs ensure our racks hold your products securely. Our displays are shipped in a protective 275lb Test box, ensuring safe arrival to your site. A hand hold opening is provided on the side of each Fixturecraft box for easy handling. None of our competitors have these features. Fixturecraft offers many color options, why settle for just one choice. Other foreign made products may advertise a lower price but charge more for shipping resulting in a minimal, if any, savings to customers. Fixturecraft displays are in stock 99% of the time and ship the same day ordered if received by 12:00 Noon Eastern Time. 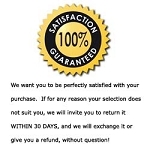 Fixturecraft Guarantee If for any reason your product does not suit you, we will invite you to return it within 30 days, for exchange or refund.